First, let's just put it out there. If someone is promising page one, number one results ... RUN! The fact is, Google is simply looking to return quality, relevant results to their users. They have nothing personal against your business or your website (though sometimes it can sure feel that way). Google has to compare your website and its content to your comeptitor's, then determine which sites will be the best to return based on their users' search. This means it's important that you know what your potential customers are searching for and to have quality content that addresses the answers and solutions to those searches. It sounds pretty basic. But Google has more than 200 factors that it looks at and some weigh more heavily than others. Oh, and did we mention they change their ranking alogrithm regularly? It's hard to depend on something (great rankings) over which you don't have complete control. So, you shouldn't. Yes, you should do all the things that Google wants you to do to increase the chances of your site ranking well, but you should never make your business 100% dependent on a page one Google ranking. It's important that while you work to improve your rankings, you are doing OTHER THINGS to market your business and stay top of mind. This includes social media and other more traditional marketing activities. On-Page SEO includes some of the technical things that Google is looking for in a quality site. Things like page speed, mobile-friendliness, appropriate use of title tags, head tags, alt tags clear and consistent navigation, complete business contact information, and robust site content ... just to name a few. Our team can provide an SEO scrub on your website to ensure all of those elements are there, as well as perform essential keyword research to ensure that your site addresses what people are actually searching for. 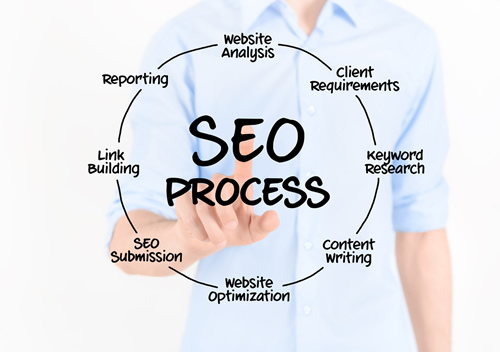 Off-Page SEO includes things that businesses do OFF their website to help improve their search engine rankings over time. This includes things like press releases, building links back to their website from quality &relavent sites across the web, building citations, testimonials, and directory listings, as well developing a robust and consistent social media presence across multiple channels. We review every site requesting the On-Page SEO package to determine if we feel we can help make an improvement in the site's rankings. If we don't feel we can make a difference, we don't take the project. Businesses subscribing to our On-Page SEO package can expect to see an improvement over their existing rankings. This package does not guarantee page one rankings, since so many other off-page factors also impact rankings. However, cleaning up and improving your on-page ranking factors can generate marked results. Monthly fee is reduced to $50/month if combined with social media engagement package, below. *12 month contract requirement dismissed with social media engagement package purchase. This schedule is subject to change or fluctuate based on client requests, or website changes. Modify/Add appropriate ALT tags to images and modify image names for better SEO. Add social links to website. Create HTML sitemap and XML sitemap. Submit XML sitemap to webmaster tools. Modify content/copy on website to improve keyword density and create appropriate anchor text. Setup Bing webmaster account for website, as well robots.txt. Setup and add sharing buttons on website pages. Submit site to 10 major directory websites. Review analytics and create report showing improvements in rankings. Modify meta tags and content across the site to adjust for lower performing keyword phrases. Prepare report with recommendations for website additions/improvements based on results obtained and lower performing keywords. Implement approved recommendations by client. Submit/setup account for site on 10 additional directory websites. Submit/setup account for site on 10 additional directory websites. Prepare summary report of results obtained for full keyword list. As of April 2015, Google factors “mobile friendliness” into the search results it returns for mobile searches. If you don’t have a mobile friendly version of your website, this will negatively impact your rankings for mobile searches on Google. While you may have a Facebook page or Twitter account setup already, is it properly optimized and is your profile filled out in such a way that it is search engine friendly? Do you have a business Google+ page? A company LinkedIn page? A business YouTube Channel? Having these channels for your business with professional cover images and SEO friendly profiles is very important for your SEO efforts. Once your channels are setup and customized, you should begin a robust and consistent social media engagement effort. $350/per month, with $50 used toward page promotions and boosted posts. Google factors social reach, social interactions, and fresh content into the ranking results it returns. A consistent, strategy-driven social media campaign not only increases brand awareness and keeps your business top of mind, it also helps move and keep and your business at top of search. 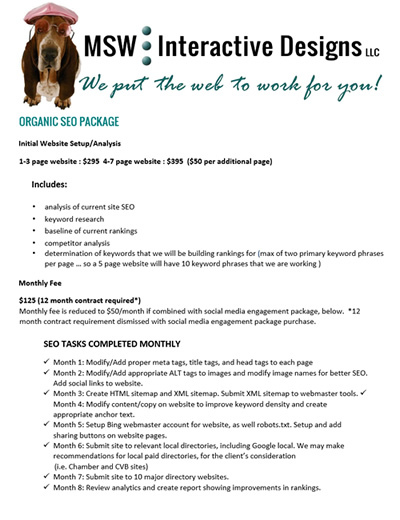 Our Full Engagement social media clients can add the SEO package outlined above for just an additional $50 per month! Top of Search - We Can Help!